"An extremely smart-looking champagne bucket style pail, made of chrome plated metal is displayed. There is a knob and ring on each side of the pail. [These knobs are the coin holders, designed to hold twelve coins in each holder, twenty-four coins total. The holders are spring loaded and require only a fingertip touch to release one coin at a time into the pail.] The pail is eight inches high and seven inches at the top diameter and five inches at the base of the unit. The performer shows the pail to be empty. He reaches into the air and coin appears at his fingertips. The coin is thrown into the pail with a clang. This action is repeated until all twenty-four coins are produced. The performer can walk through the audience producing coins from various places, etc. No skill is required. This is a precision-made quality product." No coins are supplied with this pail (the same way Abbott's sells it). I do have a copy of the original instructions to go with it. This is one of the finest type gimmicked pails for the classic Miser's Dream routine. Please Note – This is in my “Used/Collectible” category...meaning I have ONE only. I do not know when or if I will get another, so if you're interested, please don't hesitate! 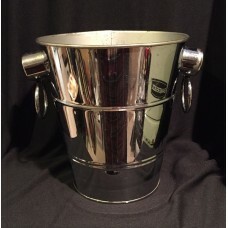 This pail is in very fine condition - no dings or dents. It has some minor scuffing and wear, but from two feet away still looks brand new. The current retail price from Abbott's is $300.00.